Quebec food is heavily influenced by the cuisines of France and Ireland, as many immigrants from these countries settled in Quebec starting in the 1800s. These influences led traditional Quebec food to be hearty yet sophisticated. More contemporary Quebec food has global influences but draws from the flavors of local organic fare. 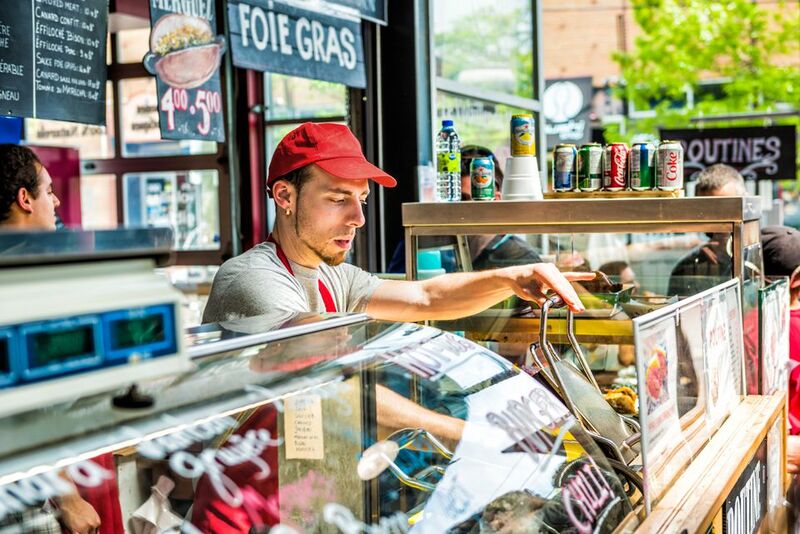 Here are some of the most popular Quebec food items you may come across. One of the culinary thrills of visiting Quebec is the chance to taste many of Quebec's artisan cheeses that are not available outside of the province, as many of the producers are small-scale and do not export. Once known mostly for its cheddars and Trappist cheeses (Oka is popular across Canada), today there are hundreds of varieties, including raw-milk cheese aged less than 60 days, which aficionados claim to be more flavorful and healthful. The Quebec Cheese Route totals 50 "cheeseries" in 14 regions where visitors can sample cheeses and even mingle with the goats, sheep, and cows. Maple syrup production is a rite of spring in Canada and draws thousands of people to sugar shacks in Quebec to see how it's made and sample the sweet sticky condiment. Quebec City and Montreal have stores devoted especially to maple syrup and maple products and restaurants feature maple syrup inspired menus, especially in early spring when the syrup starts to flow. Like a paté, but a bit chunkier, creton (cray-tawn) is a fatty pork spread seasoned with onions, cloves and maybe cinnamon, nutmeg or garlic. Creton is a popular part of traditional Quebécois cuisine. It is a popular breakfast item but can be served any time, often with homemade pickles and crusty bread or toast. In Quebec, you will often come across creton in small disposable plastic containers at restuarants like you would butter. Pouding chômeur (pudding show-mer) is simply delicious. This maple-y pancake-y pudding-y dessert was once a "poor man's pudding," created to make use of everyday, inexpensive ingredients, like flour and sugar. Today, it's served in a wide range of restaurants. In Montreal, try pouding chômeur at Bistro Cocagne. Tourtiere (tor-tee-air) is a traditional Quebec meat pie that is particularly popular during the winter months. You'll see this item on menus at sugar shacks during maple syrup making season as well as traditional French-Canadian restaurants. Or, you can always try to make it yourself. Baked beans, or fèves au lard, pronounced "fev-o-lar" are part of the traditional Quebécois cuisine. Like creton, feves au lard is a popular breakfast dish, as historically these foods gave trappers high amounts of fat and protein for energy to start the workday. In Quebec, fèves au lard often are infused with maple syrup. Try them at The Binerie in Montreal's Plateau district, one of the best traditional Quebec breakfast spots. Sugar pie (French: Tarte au Sucre, pronounced "tart-o-su-cra") is a little like a pecan pie without the pecans or a butter tart. This sweet, simple dessert is also popular in New England, Belgium, and France, but is hard to find in Canadian provinces other than Quebec. Sugar pie is essentially what it sounds like: sugar or maple sugar, butter or cream, flour and vanilla in a pie shell. How can you go wrong? Pea soup, thick and hearty made with a ham hock broth is a winter favorite. This soup is made traditionally with yellow split peas, salt pork, herbs, and broth.
) is much like a shepherd's pie: ground beef and onions layered with corn and topped with mashed potatoes. Despite its translation, "Chinese pie," paté Chinois is not a Chinese dish, but probably a dish made for Chinese railway workers using inexpensive ingredients during the building of the North American railroads in the late 19th century.